This was with a bunch of T parts in a barn. Can anyone identify it by chance? Looks like an overhead valve cylinder head with eight ports. With eight ports it’s not any common Rajo or Frontiac. On my way to the frozen north, in Seattle waiting for a seaplane to take me to Desolation Sound. With the heat wave the west coast seems to suffering, I suspect the temperatures will be very pleasant. I am awaiting more photos and I will post some. I was'nt sure if it was T related or not(aftermarket). Thanks for the help I appreciate it. The part about the tractor that is throwing me off was that intake/exhaust on tractors are on the left of the engine vrs automotive on the right hand side. I'll keep searching and update pics. Ferguson TE20 tractor. No performance upgrade here... thanks again. If it is a Massey Ferguson TE20 head ( it does look like it) the early MF tractors used Continental engines in them. 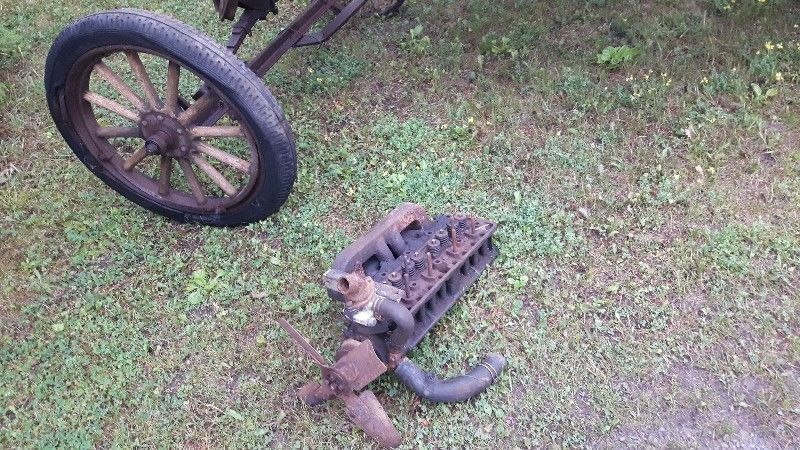 So that would mean it's a head for a Z120 Continental engine. Stevens Ag Parts makes this reference in their Stevens Ag Parts catalog. For the old tractor enthusaist who needed one they won't be cheap if you needed to buy one.